Paid in Full is a shaped summer shell with simple lace panels centered on its front and back. This design is worked bottom up and seamlessly in the round. Its neckline dips slightly lower in the back for a romantic turn and is trimmed there and at its edges with the 2x2 rib spawned from its lace stitch pattern. 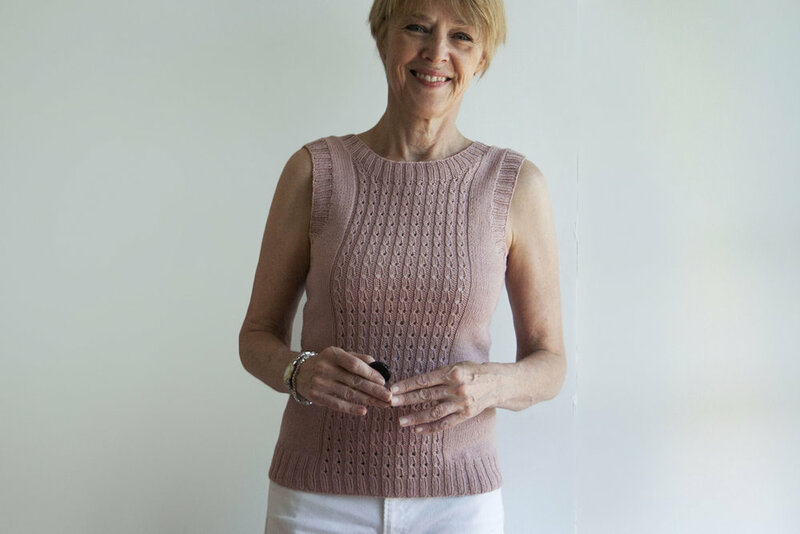 A perfect warm weather knit I'd say for both making and wearing. Enjoy! Shown in Tern yarn by Quince & Co. (75% American wool / 25% silk; 221 yards / 202 m per 50g skein); color – Quartz #422; 3, 4, 4, 4, 5, 5, 5 skeins, or for comparable yarn, approximately 625, 705, 785, 885, 965, 1035, 1090 yards / 575, 645, 720, 810, 885, 950, 1000 m.
Long-tail cast on, circular knitting, decreasing (skp, ssk, k2tog), increasing (m1L, m1R, yo), short row shaping and 3-needle BO at shoulders, stitch pick-up around neckline and armholes, and blocking. 12 page PDF includes pattern instructions, photographs, schematics, instructional links, a row tracker for ease in managing lace rows while shaping, and definitions for relevant abbreviations.